When I learned of the Oceanic Performance Biennial and the organizers’ call for participation, the idea appealed to me. The event will be held on Rarotonga from July 23rd to August 1st, 2015 under the title of “Sea Change” and is organized under the auspices of Emergent Ecologies, Performance Studies inernational and AUT Art & Design. Just in time before the deadline, I handed in my proposal for a performance installation. Now I have to be patient and hope for acceptance. Whether it will be accepted or not, I will go ahead with the project anyway, because it also fits in nicely within the scope my current research. In my mind I immediately saw the Edna and wanted to make a “Spirit Sail” for her. Spirit, here not to be thought of as spiritualism, but rather as absolute freedom. Absolute (from Latin absolutus = detached, freed, unrestricted), detached from material restrictions and free to wander on, rest-less, leaving her rusty remains behind, and fluid, iron and copper dissolving in rain and seawater into rust and verdigris. 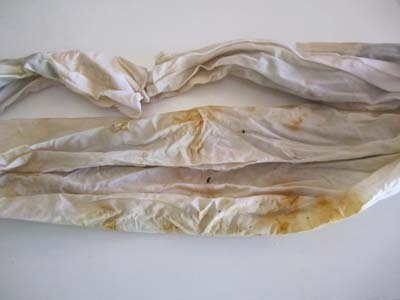 In a processual work I aim to touch this restlessness in its chemical and inorganic compossibility, using the fragile remains of the Edna as support for ‘printing’ onto cloth. 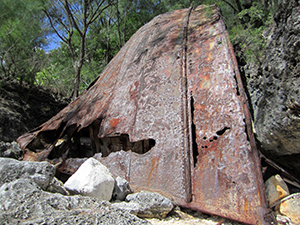 The material form of the rusting iron hull binds to the cloth, producing some memento mori, some ‘still-life’. Memory of touch will be re-membered, enhanced, and added-to in a sequence of technical processes such as wrapping, binding, dyeing, printing, sewing, exposure to elements, layering, composition and decomposition. It is my aim to take these “Spirit Sails” on a voyage between islands, installing and altering them in different oceanic locations until they reach Rarotonga. This will become a visual diary of the project’s practical process and development. It was prize-giving day for the students at Atiu College that day. M/S Edna had arrived, but the sea was too rough to offload her cargo that fateful November 28th 1990. Atiu’s barge driver, the late Papa Roi Viti, had suggested that the vessel continue on to neighbouring Mitiaro and come back the following day. 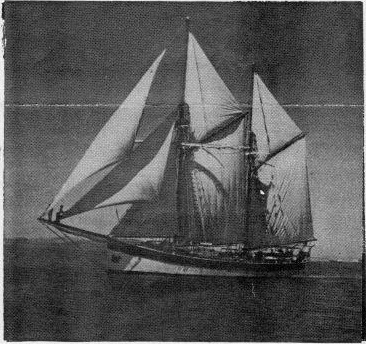 However Edna’s Captain, the late Nancy Griffith, decided to leave the schooner anchored offshore with emergency staff and follow the college principal’s invitation to celebrate the student’s achievements that evening and wait for calmer seas in the morning. That proved to be a fatal desicion. At 1:30 AM the wind turned and the schooner, full of cargo and with all crew back on board, was slammed onto the reef. Rarotonga’s harbourmaster, the late Captain Don Silk, remarked in an interview with Lawrance Bailey from Cook Islands News that “it wouldn’t have taken much wind to put the ship on the reef as the anchoreage at Atiu was very close to shore. In Atiu when the wind is off-shore, with any change of wind a ship was in danger” (CINews, 29-22-1990). Most of the unisured cargo was lost. For the captain, also one of the ship’s owners, who wasn’t even able to salvage much of her own belongings, this was a hard price to pay. For Edna, it was the end of her seventy-four-year sailing career. The ship broke apart, one half sank into the depth of the ocean. 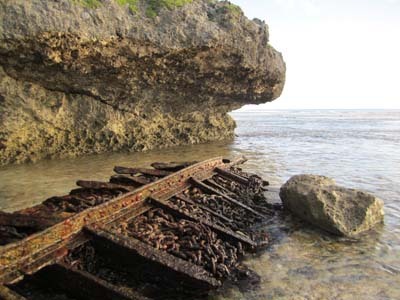 The other remains now lie scattered and exposed to the fierce elements in between the large boulders of fossilized coral that litter the beach. Hurricane-force winds and high seas wedged her broken bow up into the passage to Ava Tapu. To me it appears as if the island wanted to ‘ingest’ her; a macabre thought. 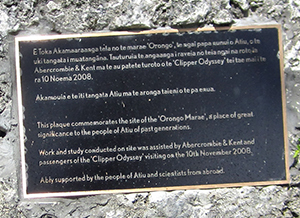 In November of 2008, Abercrombie & Kent and the passengers of the Clipper Odyssey sponsored an archaeological project, implemented with the help of the Atiu people and under the direction of Dr. Hiro Kurashina and Dr. Rebecca Stevenson, to re-establish and clear the location of the sacred welcoming site of Marae Orongo i Tai. I was contracted to record the project progress to make a video documentary. Sadly, today, two of my interviewees have already passed on. The knowledgable elders told us about Ava Tapu, the Sacred Harbour, and the function of the adjacent sea-side marae. In pre-European times, when a foreign canoe approached, it was never known whether the seafarers came as friends or as foes. On the inland marae in the district of Mokoero across from the chief’s court, the priest consulted the gods. 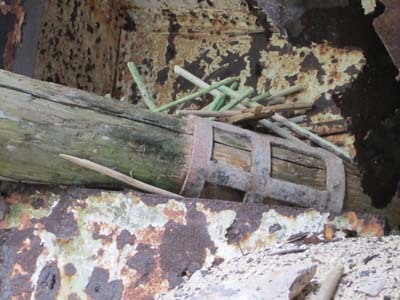 If it could be assumed that they came as invaders, a huge stalactite , now sleeping in the weeds at Marae Orongo, was erected as symbol for the war god Tutavake. The god’s head – today located on top of the marae’s platform – placed on top of it. 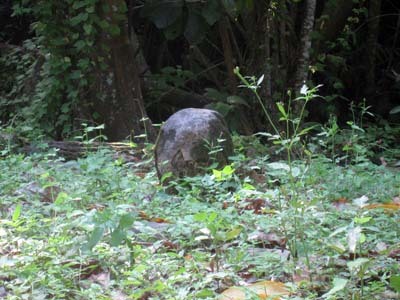 Fierce battles ensued in which the brave Atiu warriors remained victorious. Papa Sam Koronui told us that, presumably, cannibalistic rituals then took place at Marae Orongo i Tai. However if the voyagers were relatives or came as friends, a feast was prepared for their welcome. As the fate of M/S Edna shows, access to the island at Ava Tapu landing is tricky because of treacherous currents. 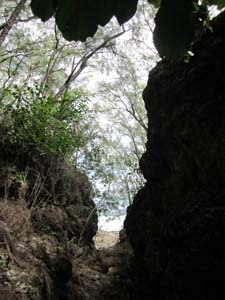 Once the voyagers made it safely across the coral reef, they would have to ascent to the island through a narrow passage (left) framed by razor sharp fossilized coral. The late Papa Ina Teiotu told us that the seafarers were ‘fumigated’, i.e. they had to walk through smoke (scented with sandalwood??). Women decorated them with sweet smelling flower ei, crowns and necklaces, before sharing food and refreshing coconut water at the welcoming site to celebrate their successful journey and safe arrival. …are wonderful moments. Everything is still possible. The mind is free to wander – and wonder how to fill an empty page with something meaningfull. I have reached such a moment, the beginning of a new project. This blog will be a visual diary through an exciting creative journey that I have embarked on. I welcome you as my passengers, commentators, advisors and critics. Protagonist in my visual narrative is Edna, a Dutch-built schooner that was beached at Ava Tapu, the ‘Sacred Harbour’ on Atiu, in November 1990. M/S Edna was chartered by the Ngaputoru Shipping Company to service the Cook Islands’ Southern Group islands. Overnighting at Atiu harbour before continuing her voyage to neighbouring Mitiaro, a change of wind and strong currents pushed the vessel on the reef of the tiny beach just next to Atiu’s harbour. Though no life was lost, most of the uninsured cargo was beyond salvaging. 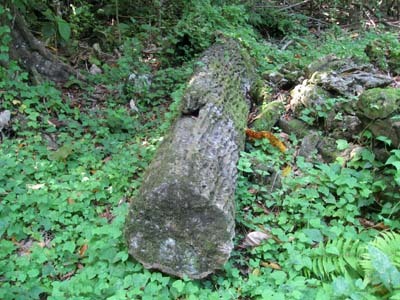 Later hurricane-force winds wedged the broken remains into a passage in the fossilized coral rocks, blocking the access passage to an ancient sacred site. 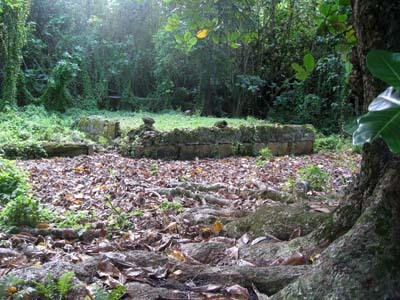 At Orongo Marae i Tai, Atiu people once welcomed visitors (or slayed invaders). A multitude of scattered pieces can be found buried along the tiny beach and on the reef. It looks as if the island has been slowly ‘incorporating’ Edna as a ‘permanent resident’. In the following weeks and months, I will present more background information, describing in detail how my new project involves the Edna and documenting the work’s progress. I appreciate your interest and comments.